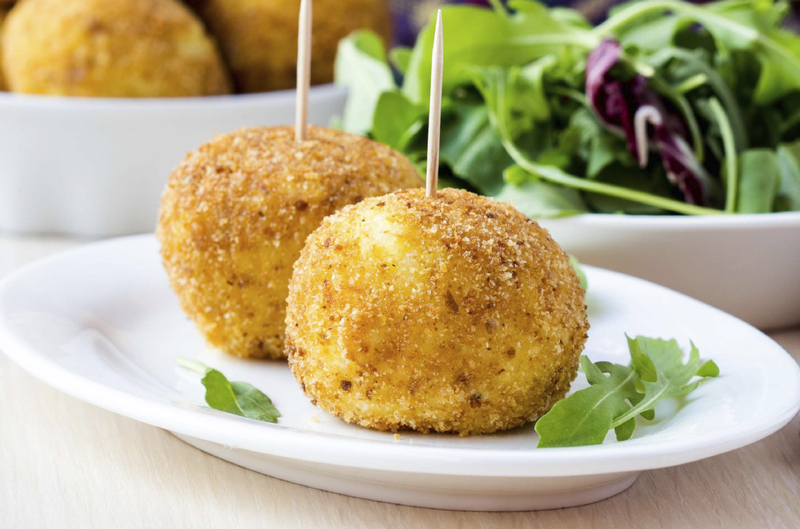 This Sicilian-style rice ball recipe, known as Arancini, is loved by many Maltese either as a snack or even as an entertainment food. Place the beaten egg in a bowl. Prepare a large dish covered with baking paper ready for the arancini balls. Take a large tablespoon of rice in the palm of your hand and pat to flatten it. In the centre place a cube of cheese and a half teaspoon of meat sauce. If you are not using meat sauce leave it out. Fold the rice around the filling and shape it into a ball. Be gentle. Dip the ball into the egg, then roll it in breadcrumbs. Once done, set aside on the tray covered with baking paper. Continue to make the rest of the balls. Wet hands make the mixture easier to work with. Place in the fridge for at least an hour. Heat the oil in a frying pan and cook the balls until golden. Serve hot or cold. Did you enjoy this arancini recipe? Comment and rate below to let us know what you think of it and share so that we can continue to bring you the content you'd love.